I keep my eye out for stumps as I drive but just find trails of milk cartons, sheltering the roadside remnants of tomorrow. And strings of flags, marking off sections with trees, sections with drains, sections of paddock; at 110 km an hour it’s not clear whether they indicate the protected plants or the ones destined for removal. In my Ararat motel room the next morning, I wake quickly, realise it’s 6:30 and snuggle down again. Then I remember that the radio interview I did the day before should be playing on ABC Rural any minute and scrunch barefooted through the puddles to the car. By the time I find the station, I’ve missed me, but get to hear a farmer talking about his crop experiments, trials of different wheat varieties that might grow better in dry soils. They’ve had 13 mil of rain overnight in Mildura and both the interviewer and farmer are happy – ‘money rain’ they call it. Driving into Great Western a few hours later, I realise I didn’t look up the address of the community hall, but the queue of people across the footpath make it obvious. 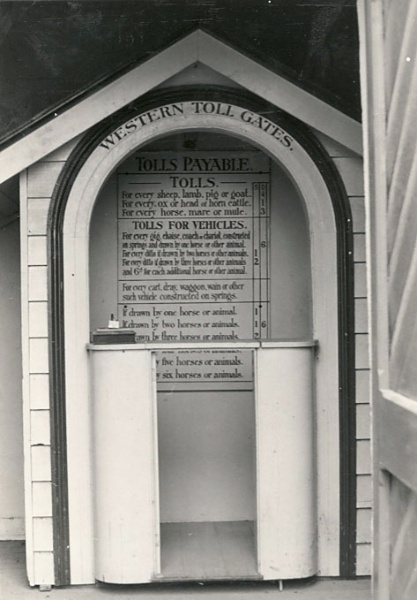 It used to cost one shilling for a one-horse vehicle to travel along the Western route, I learn from the historic toll gate at the hall entrance. Prices increased up to I-forget-how-many-shillings for a vehicle ‘constructed on springs if drawn by six horses or animals’. Entering the hall, we each choose a home-made mug, and mine curves beautifully within my hand as I juggle bags and USB sticks, load my powerpoint presentation and find a seat. It’s a different crowd to most ecology conferences, filled with the grey heads of local landholders but interspersed with a few younger folk, mostly here for work. Around us, a talk about species distribution modelling continues. My thoughts go back three weeks to my Nan in hospital, my arms around her skinny back as she sweated and panted and finally breathed ever more quietly till the nurses came and turned off the hissing oxygen tank. But this chap, thankfully, is reviving and walks out with the paramedics when they arrive. Matt Herring gives a talk about his bittern project. Ten years in, he’s still astounded – the biggest breeding population of this endangered bunyip bird is in the rice fields of the Riverina. Not the organic ones, he explains in response to a question, nor the ones where they’re trialling different strategies to save water, but the mainstream, regularly sprayed with pesticide, flooded crops. He’s got photos of an 11-day-old bittern, already lanky, cupped in the dirt-stained hands of a rice farmer. The babies grow so fast that they fledge safely before the fields are drained and the harvesters come in. In the afternoon, we tour a Trust For Nature property. The owners are waiting at the gate as our bus pulls up, fencing rings in hand. They’ve just farewelled a prison crew that had been working on their property that morning. The bloke is passionate – trees, grasses, shrubs, birds, legless lizards – he shares the stories of how he and his wife have transformed this land from sheep paddock to bush. ‘It’s drying out,’ he reckons. ‘See how the native cypress here are dead, all except those ones at the gate. We got them from a nursery that was using seed from Little Desert. They’re thriving, but the local-sourced plants can’t make it anymore.’ A hillslope that used to seep water through sedges and melaleuca is just granite and grass, the dam is nearly empty. ‘Used to have murray cod, trout…wonderful. But the water got too low and now it’s too hot in summer. Found them all floating, belly-up’. They’re going to trial a bandicoot release in their predator-proof paddock. At dinner time, Isabelle sits next to me. A fine-featured white-haired woman, she reminds me of my German piano teacher, but hails from a farm near Mount Buangor – ‘you won’t have heard of it’. I spent three years living in Creswick so I know the region well. ‘So then, you know the wind-farms, that’s my property. My daughters’ actually. We split the land between the three children. And now the McKenzies own most of them, the McLyons* have a few toward the east and the MacDavies have the other end. 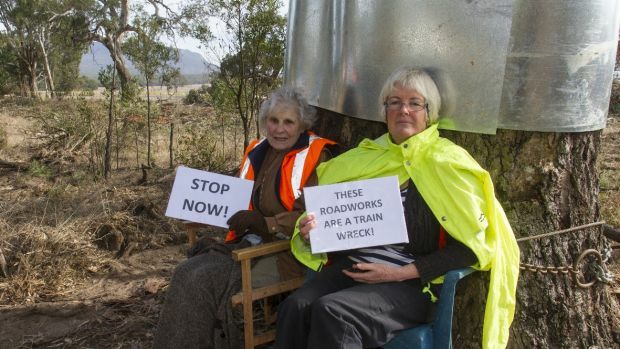 Lots of Scots in our region.’ Later on I learn that she’s 91 and earlier this year chained herself to a massive redgum along the proposed highway route. We listen to Jonathan Starks describe his community survey project, monitoring woodland birds across the Wimmera. They’ve recorded threatened species in regeneration plantings only three years old. Someone asks about succession planning: if most of the bird surveyors are old, what’s going to happen when they pass on? Is all the knowledge just going to be lost? Jonathan disagrees. The young folk are mostly too busy with work and families to volunteer, but new retirees keep joining. He even had a thirteen year old boy who came on every survey. ‘Used to ride his bike out to the sites, keen as anything. Then he found girls.’ ‘Got interested in a different kind of bird,’ a bloke chips in. The evening finishes with climate scientist David Karoly. ‘We no longer have the Goldilocks option,’ he begins. ‘We can’t choose ‘just right’ anymore. It’s hot, hotter or hottest.’ His research group are out-sourcing their data analysis to the community’s computers – just download their app and your PC can crunch climate models overnight. Thousands of people have volunteered, enabling the equivalent of 40 super-computers worth of analysis. Finally, the cooking ladies are thanked, the chairs stacked up and last chatterers move toward the door. Back in my motel room I turn the heater on. The walls rattle as the trucks race, bumper-to-bumper, up the Western Highway. Clear felling an hour from Melbourne…and beyond! Thanks for sharing these links Steve. It turns out that Isabelle-from-dinner was the 91 year old grandmother who chained herself to the tree in the first article. I’ve added some of your info as extra links and photos to the blog. I’m surprised at you Bron – you had the chance to use the oldest Scots joke in the world and gave it up! !